They are truly gorgeous records. Every last word so carefully formed, so very legible, so clear, so crisply written. It makes you want to kiss the Clerk, whoever he was who so carefully recorded each and every one of the land transactions in the however-many first pages of Deed Book 1 of Outagamie County, Wisconsin. And — it has to be added, with some regret — whenever it was that he so carefully recorded each and every one of those land transactions. Because it’s a sure bet they weren’t recorded when they occurred. And every word, including the signatures, is written in the same careful and lovely handwriting. And so it goes, page after page. They are lovely records. They are legible and clear. But what they are not is original records. They’re later copies, recorded after the fact, in some cases clearly years after the fact, and by a clerk or clerks unknown today. There’s no doubt they’re good records, in the sense of legally binding. They may well be the only surviving records of very early land transactions. In the absence of an original document tucked away in someone’s family files or a library somewhere deep in the Wisconsin woods, these deed records are the best evidence of what happened all those years ago. But they are copies, not originals. And good genealogists never make the mistake of believing that copies are always going to be exactly the same as the originals made at the time of the transaction. What am I missing here Judy. This is true of most will and deed books. The clerks make copies and return the originals. We all know they are copies but it is usually the closest we can get to the originals. In the case of wills they are probably pretty accurate unless you also see a flurry of legal action over the disposition of assets. The same can also be said of Deeds, especially if you plot them and their contiguous neighbors and they plot reasonably correct. All that you’re missing is (a) there may be an original out there somewhere (so don’t forget to look for it) and (b) because this is a copy there could be errors — and those errors may explain why there are problems down the road. As usual, you got it, Judy! 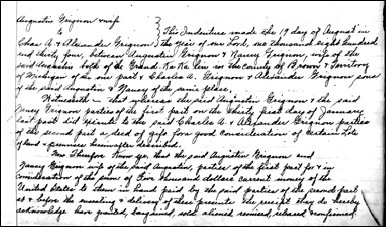 These deed books (and other courthouse books such as will books) not infrequently contain cross-outs, particularly in boilerplate formulations, where the clerk corrected an error that he detected while he was copying. Sometimes you find interlineations, sometimes phrases are repeated, or language shows that something was omitted. The modern user quickly gains respect for the clerks who created the books by hand, and the overall accuracy of their work, through the process of transcribing the records they copied. I have added 18th- or 19th-century courthouse clerk to my list of occupations I would be very bad at! The clerks do make errors in their transcriptions. It’s a good idea to see if a corrected entry exists. For instance while reading in a deed book in my home county, I ran across a deed that had the land description for my property with someone else as the purchaser! I kept looking through the deed indexes, and sure enough, I found a corrected entry. P.S. These were not in someone’s lovely writing; they were typed. Very good post, Legal Genealogist. This is a difficult concept to get through to clients, many of whom seem to think recorded wills are “original” source documents. Legally, as you say, they are. BUT, nothing beats an original. For skeptics, I love to use the example of a will in Brunswick County, Virginia where both the original and the recorded copy exist. The original names granddaugher Elizabeth Wilkins while the recorded copy calls her his daughter. As you say, mistakes happen. And there are more originals out there than people may think. Rare enough, but not unheard of if you now where to look for them. Not an unusual problem at all, Craig. Thanks for the example. Thank you for this interesting post, and an issue it raises for me. I’m currently trying to help someone who claims he’s my 3rd cousin once removed–and I don’t doubt that he is. But his understanding of the importance of sources is somewhat limited. He applied to a heritage society, and they turned him down because of holes in his sources. I’d previously suggested he wait, beef up his sources, and look for additional, and more-original documents. I’ve got the actual Bible of our mutual ancestor, with his gg grandfather’s birth listed among 4 generations of vital statistics (in different handwritings). I have census records that go with this, including the 1880 in IL, showing he was b there. That matches the Bible record. By 1900, this fellow’s gg grandfather was in NM, claiming he’d been b. in the state of LA, with a different year of birth (that of a dead half brother). His death certificate matches the NM censuses, and his daughter gives her grandfather (whom she’d never met) a first name I’d never heard of. No wonder they turned him down! I can’t find a will for my gg grandfather, who died penniless in any case. I also have, in addition to the family Bible, two letters the man in question and his wife sent to my by-now widowed gg grandmother soon after their marriage. One, from the wife, is clearly in response to a letter she had sent them, the other, from the son, raves over the birth of their first child. I can’t completely account for why he left home in the 4 year window between the 1880 census, when he was 20, and his father’s death in 1884, but another 3rd cousin and I have concluded there was some sort of estrangement between father and son. We have some solid reasons, and some good speculative ones. More original sources would surely help his case, but my putative relative now has copies of the original letters and the Bible listings of his birth in IL. Maybe the committee will look more kindly on his application with these original sources. A related question for you, though I know it’s not your primary area of expertise. There is no descendant in the direct male line. Would autosomal DNA testing help prove his gg grandfather was the son of my gg grandfather, as he wants to prove? It’s possible, but the relationship is far enough back that it’s just as possible it won’t be able to help. Autosomal DNA changes so dramatically every generation that it can only be used to prove, and not disprove, a relationship that far back. …and this is the reason why one must look at more than the one lovely deed (or document) in a series, and continue looking for the original and/or other copies. I’m definitely impressed with the clerk’s lovely handwriting, of course – why aren’t all MY ancestor’s wills/deeds/bonds etc. all written so beautifully?! And I’ve often wondered, were the clerks men? or women? or either? An excellent post, on a knotty problem in documentation. A well stated reminder! This post also caught my attention because we’ve recently determined that one of my mother’s mysterious grandfathers (neither of whom is now as mysterious as before DNA testing!) belonged to an Outagamie County family. We were just there looking at probates and obituaries, but did not get as far as land records, which for this immigrant group would have begun in about 1850. Good luck in your research! Outagamie County’s records predate the existence of the county, so you should find some goodies. I was interested to find that the people I’m tracking arrived right around the time the county was formed. However, it’s always possible that something will point to older records (land, for instance).